Going to the dentist can be stressful for some children. The setting, unfamiliar people, and strange instruments may cause anxiety. 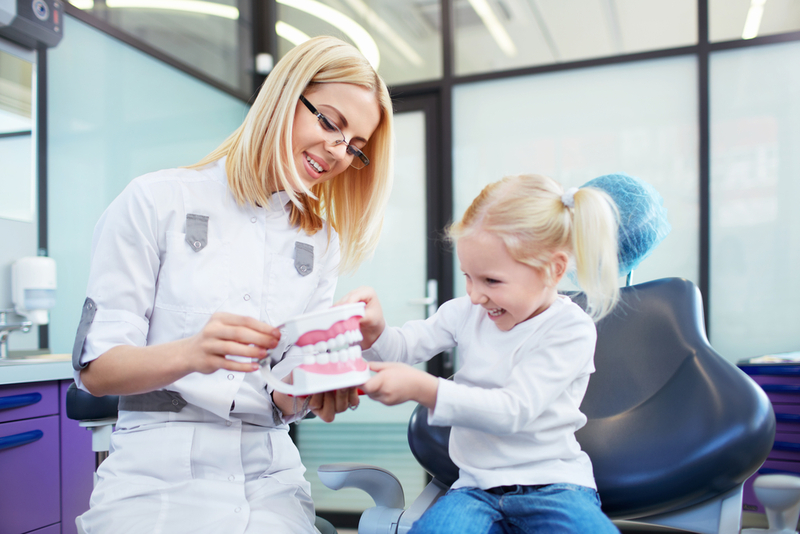 If your little one has expressed fear or concern about visiting the local pediatric dentist, help the child feel better by emphasizing the importance of dental care in fun and relatable ways. Integrate books about going to the dentist into your child’s bedtime to make the topic more familiar. There are plenty of picture books with characters like Doctor De Soto, a mouse dentist, or “The Crocodile and the Dentist,” a clever book where both the dentist and the crocodile are nervous about the appointment. Encourage questions after you read together. Watch videos with your child on sites promoting pediatric dental care, such as MouthHealthyKids.org from the American Dental Association®. The videos feature familiar characters including Elmo from Sesame Street® and Dudley, the adorable cartoon dinosaur. The dental-related videos depict going to the dentist, brushing and flossing, and related topics. Make it clear you value your dental health by scheduling teeth cleanings and checkups every six months. Take your child with you if possible to show you are not afraid of the dentist. Be diligent about home care as well, brushing for two minutes twice a day and flossing once a day. You can even make the routine a family affair. Brush and floss with your kids and put on upbeat songs to pass the two-minute mark in a fun way. Smile Central Dental in Paterson, NJ makes it easy to find a pediatric dentist your child will really like. The family dentistry center has an excellent community reputation thanks to years of experience with little patients, a comprehensive range of dental care services, and a sweet therapy dog named Snickers who routinely calms and soothes children. Call (973) 742-4200 to schedule an appointment at the Paterson location or (973) 574-1000 or (201) 325-8444 for the Passaic or Union City locations, respectively. Visit the website for more helpful information.